I think that all juniors that are reaching the end of their junior careers begin to worry about the future at some point, and not necessarily the educational one. What happens when you age out of the juniors? You know, the dreaded post-junior years? When you leave for college? When your equestrian life is basically over for the foreseeable future, how do you deal? I often see young riders asking for advice on how to stay involved with horses during the post-junior years, and how to afford such an expensive hobby when you are struggling just to afford food that is better then Ramen. I remember that when I was at that age (barely though, it was so long ago), that I had the exact same worries and questions. Best pony and junior rider I ever got the chance to work with. 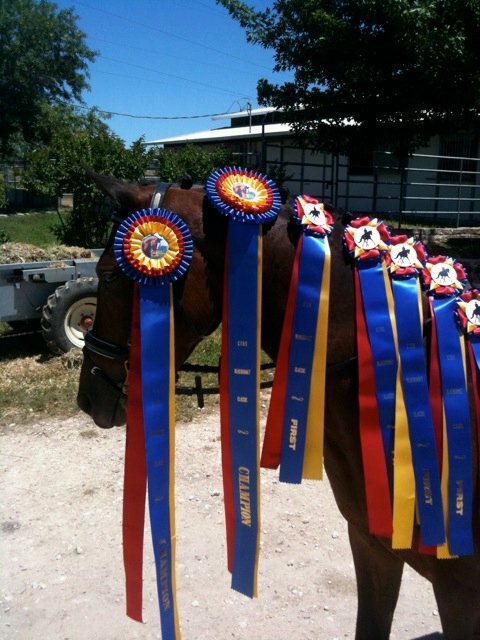 You can barely see Tinkerbell underneath all of her ribbons! 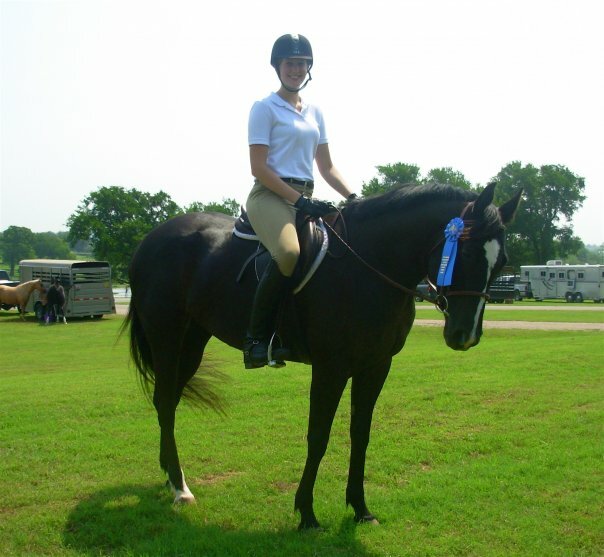 When you are TRULY horse crazy, taking a break from horses during the post-junior years just isn’t really an option. Yes, you may be going to college and living on a shoestring budget, but you NEED horses in your life. I honestly do not have all the answers, as everyone’s situation is so different. My cousin prompted me to share my own story, so that is what I can do. I am happy to describe how I kept horses in my life through the years, and hope that it gives other young equestrians some ideas for keeping horses in their lives as well. This story will be divided into 2 parts: the immediate post-junior years (aka college) and then the young adult years (life after college). I was VERY lucky, and the college of my choice gave me a partial academic scholarship, as well as a partial equestrian scholarship for their NCEA equestrian team. Of course, the scholarships didn’t cover all of my college expenses, but I am going to to try to stay focused on the horse aspect of things and not the insane cost of a college education. For some, being apart of the equestrian team would be enough horse interaction, but I found myself wanting more. Although I practiced with the team (on team horses) about 3 times a week, and had barn chores once a week, I still found myself wanting to do my own thing with horses. 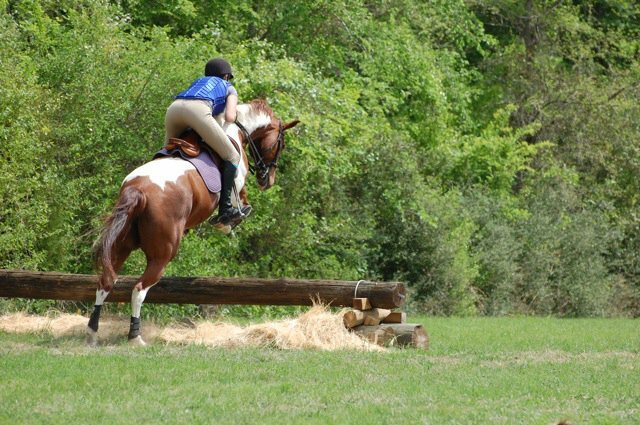 Equestrian teams are an incredible way to be involved with horses in college at no cost to you, but they are very regimented, and “free riding” time isn’t always easy to come by. I missed getting to ride for myself, for the love it. I missed NOT being on a regimented schedule. I grew up mostly riding by myself (not in a full training program), so I was used to alone time with horses, and I wanted to get back to that. Fancy, another sweet mare. She was a blast, and I even got to show her at some local open shows. I was very lucky, and found a local barn where a few of my team mates kept their personal horses, and I started hanging out there. College kids are often SO busy with school commitments that they can’t dedicate 5 days a week to riding their horse. So, if you meet the right people, it can be pretty easy to find some free saddle time if you’re motivated. Once I got a ride or 2, and spent more time at the local barn, more opportunities opened up. Busy adult amateurs with families and other commitments started offering me saddle time on their horses too.I had spent enough time as a junior receiving instruction that it was actually kind of nice to just relax and be with horses in a stress free environment. The best part? None of it was costing me anything other then my time. I had 2 barns to ride at (the college barn and the local barn) and a plethora of horses to work with. In my later college years, I started teaching up-down lessons at the local barn’s riding academy, and some low level dressage lessons for some of the adult amateurs. Between classes, team practices and work-outs, tutoring sessions, and working at the local barn (including traveling to some shows), my weeks got prettyyyy hectic. Pretty much every hour of every day and all weekends became booked. I was constantly tired and sleep deprived. I also wasn’t some kind of saint- you have to remember that a good deal of Friday and Saturday nights were spent at the bars and parties with friends, so that certainly didn’t help with the exhaustion. This mare was super fun! Her name was Lola. 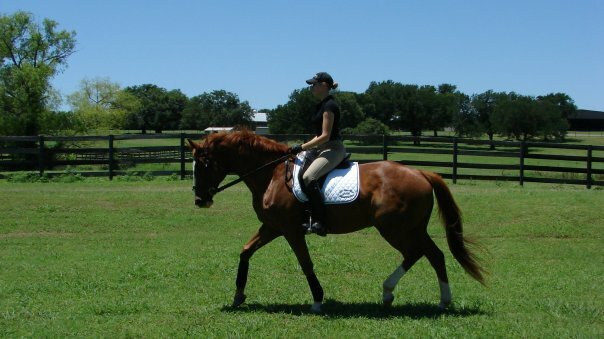 We mostly did dressage together, but a little bit of jumping. 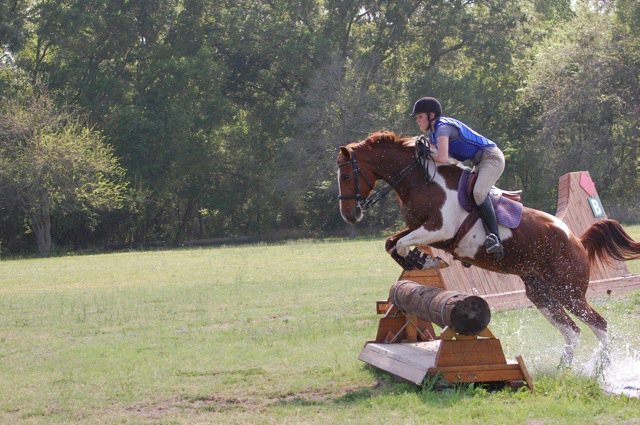 This was her first time ever out on XC and she was a saint! But, exhaustin aside, these years were really important for my riding career. I was able to ride SO MANY HORSES. Up until this point in my life, I hadn’t been exposed to such a variety of horses. Not being under the watchful eye of a trainer, I got to experiment and develop a bit more of a feel for what worked and what didn’t, and how to assess each individual horse. I was still receiving instruction from my college team coach, so I was able to use what I was learning there on horses at the local barn. I learned a lot about how to schedule my time as well. My planner was my LIFE. I realized that I could be pretty darn efficient if I planned out everything. Was I crazy busy basically all the time? Hell yes. It’s amazing what we can do when we’re in college! I brought my horse to college but also cleaned stalls, free rode for other people.. it was insane! Especially since I had a full class load and like you, wasn’t exactly a saint at night…. So I didn’t ride at all when I was actually at college. I went to a school outside of Boston and the horse world in that area is even more expensive that the Northern NJ world I had been used to. However, whenever I was home, I was offered rides for free at the barn I rode at in HS, and many summers I rode 6 horses 6 days a week. I helped move jumps, haul hay, run schooling shows, groom horses, etc etc etc. However, when I was at school, I was just a regular college student. 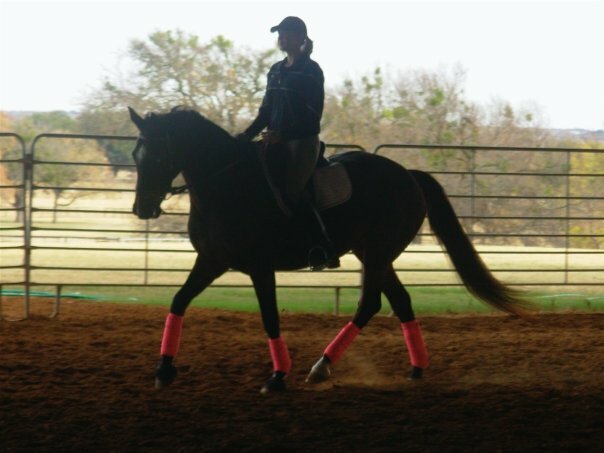 I rode on my university’s IHSA team for two years, and then took a break for about two years. My personal horse stayed in my hometown while I got my degree, but as soon as I graduated and got a job, I moved him to be with me. It took a lot of sacrifice and budgeting, but it was worth it.